Members of our popular Water Leaders program increase their knowledge of the state’s most precious natural resource while creating fond memories spent on water tours and at events with their classmates and working on the team project. The yearly class began at the Water Education Foundation in 1997. Now, 20 years later we are hosting a Water Leaders reunion as part of our 40th Anniversary celebration Oct. 26 in Sacramento. A few tickets are still available for our Nov. 1-2 San Joaquin River Restoration Tour, a once-a-year educational opportunity to see the program’s progress first-hand. The tour begins and ends in Fresno with an overnight stay in Los Banos. Want to keep track of the Water Education Foundation’s events, tours and educational programs? We offer various options besides this eNewsletter. Our Twitter site features photos of our tours and other events, factoids about our upcoming 40th anniversary and breaking news alerts. The Water Education Foundation opened its doors in 1977 when California was in the second year of a major drought, and it quickly became a vital source of nonpartisan, in-depth information about water resources in California and the West. Over the years, the Foundation has provided a vast repertoire of news, educational materials and programs designed to increase awareness about water, including tours of key watersheds, workshops, a quarterly magazine, Western Water, and Project WET (Water Education for Teachers). Applications are now being accepted for the 2018 William R. Gianelli Water Leaders Class. The one-year program fosters a deeper knowledge of water issues and leadership skills. Criteria for acceptance include a commitment to understanding water issues and an interest in seeking leadership roles on public boards and commissions, or key staff positions. When the Water Education Foundation first produced its iconic California water map in 1979, a side of beef donated by a rancher was raffled off at a major water conference to help fund its creation. Today, the maps are displayed at highway rest stops and offices up and down the state. The hot water topic back in 1982 was the Peripheral Canal. When the Foundation first wrote about the proposal for Western Water magazine, some 10,000 extra copies were sold at 35 cents each. Explore more than 100 miles of Central California’s longest river while learning about one of the nation’s largest and costliest river restorations. Our San Joaquin River Restoration Tour on Nov. 1-2 will feature speakers from key governmental agencies and stakeholder groups who will explain the restoration program’s goals and progress. Forty years ago, the Water Education Foundation opened its doors in Sacramento as a nonprofit, nonpolitical, tax-exempt educational organization. At the Water Education Foundation, we publish informative layperson’s guides, colorful water maps, and water awareness materials! In the Summer 2017 issue of Western Water, “Now Comes the Hard Part: Building Sustainable Groundwater Management in California,” Writer Gary Pitzer looks into the efforts of agencies beginning the task of bringing their basins to a level of sustainability in accordance with the Sustainable Groundwater Management Act (SGMA). California’s landmark 2014 law aims to repair the effects of decades of unmanaged groundwater pumping, which have left some parts of the state in “critical” overdraft. What is groundwater? Where does it occur in California? What is an aquifer? What is overdraft? And how can groundwater be managed? These are all important things to understand in a state where 40 percent of the water supply comes from underground. But what does an aquifer look like? And how is water extracted for use on farms and in homes? 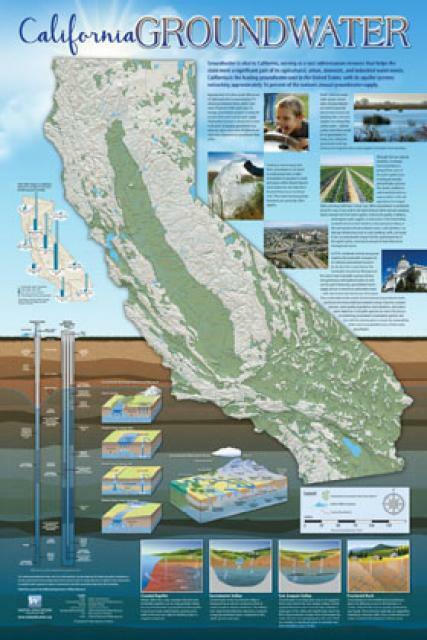 Those questions are illustrated on the Foundation’s beautiful California Groundwater Map poster, which was updated and re-designed earlier this year. What is groundwater? Where does it occur in California? What is an aquifer? What is overdraft? And how can groundwater be managed? These are all terms in the news as the state moves forward with implementation of the landmark Sustainable Groundwater Management Act (SGMA). If you haven’t already heard, the Water Education Foundation is turning 40 this year! We are celebrating in style on Oct. 26 in Sacramento, with the added bonus of a special reunion aimed at graduates of our Water Leaders program, which is celebrating its own 20th birthday. Registration is coming soon but you or your organization can sponsor this special event now and secure seats at this limited capacity event. The highest sponsorship level secures a full table of 10 seats. 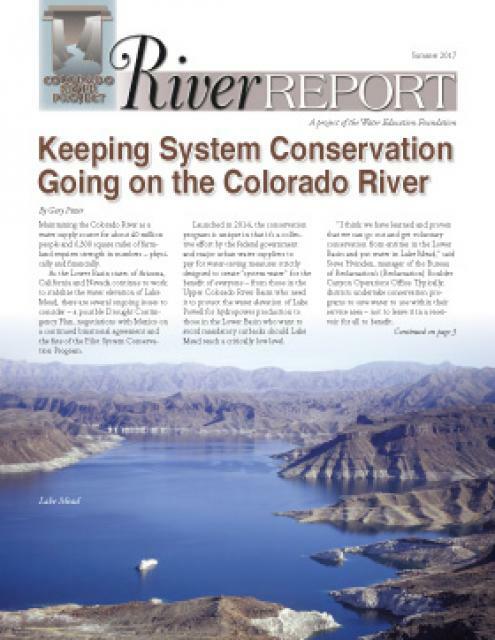 In the newly released Summer 2017 edition of River Report, Writer Gary Pitzer delves into the successes and challenges of the Colorado River Pilot Conservation Program. The program was launched in 2014 as a collective effort by the federal government and major urban water suppliers to pay for water-saving measures strictly designed to create “system water” for the benefit of everyone. You can keep up to date with events, tours and other comings and goings of the Water Education Foundation through social media. We use our Twitter account @WaterEdFdn to keep you posted on our upcoming events and tours, and to list the top water stories from our week-day news aggregate known as Aquafornia. We also tweet and retweet breaking water news throughout the day. In 2017, it is likely that no other water story grabbed as many headlines in California and across the country as the flood incident at Oroville Dam, the centerpiece of the State Water Project and its largest water storage facility. On our upcoming Northern California Tour, we will spend time at the Oroville Dam visitor’s center and meet with California Department of Water Resources staff. You’ll see drone footage from February’s flood incident, learn the engineering background on what led to it, and hear about plans to stabilize the spillway before the next winter storms and to finalize repairs by 2018.